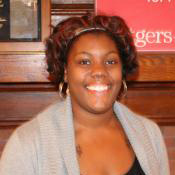 Jasmine received her bachelor’s degree in Criminal Justice at Rutgers–Camden. While earning her degree, she was the Administrative Assistant at WRI. Page last updated by Senator Walter Rand Institute for Public Affairs at 12:39 pm August 2, 2016 . This page was printed from http://rand.camden.rutgers.edu/2014/02/18/aycox-jasmine/ at 4:07 PM Monday, April 22, 2019.